Place your order now & save, click here. (for 3-4 color imprint 250 piece minimum). 2nd side imprint: Add $0.30 per color per imprint. Full color direct imprint available, please call our plant. Telephone at the bottom of this page. Proof: If requested, add $12.00 for email/fax proof of your logo, text, or both. Any author's alterations made after the proof has been sent to you, click here for artwork modification/ preparation. CUSTOM ARTWORK/LOGO/: Please provide Computer Generated Artwork in Vector Format 300+ dpi and email it to us in (.eps, .ai, .pdf) files. To email your artwork to us, click here. If you need artwork preparation, or requirements, for details go to the following link: Artwork pricing, requirements, preparation, and e-mailing artwork to us, click here. Requirements to prepare and/ or e-mail artwork to us, click here. Set-up (Screen/ Plate Charge): Add $30.00 per color - per design. 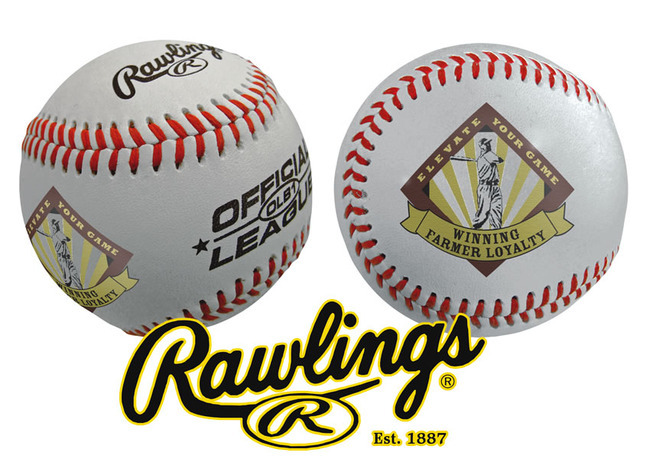 Unimprinted (blank) Leather Baseball ARAWL, $6.80 each in minimum quantity of 40 pieces per order. Random sample: For Rawlings® ARAWL Official League Leather Baseball. $16.00 each to cover cost & shipping. Bulk, approximate 45 LBS./ 100 balls. From receipt of complete order and approved artwork, please allow approximately 10-15 working days production time in the plant on customized merchandise, unless otherwise noted. We reserve the right to ship and bill 5% over or under the ordered amount on customized merchandise. To place your order, click here. Then follow the instructions in the ordering form, or call us and place your order by phone. Remember. Customer satisfaction and high quality service to our customers is our main goal. E-mail your questions to: Customer Service, click here.